The Danish cartoon saga is not yet finished. 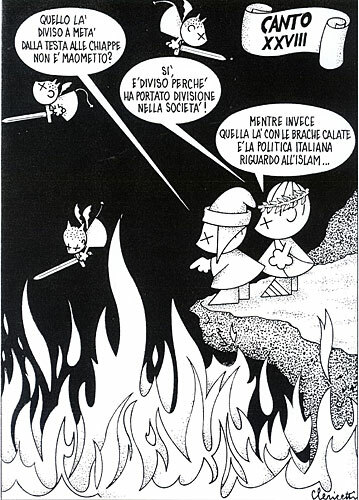 Today comes news that the March issue of Studi Cattolici, an Italian magazine close to Opus Dei, published a cartoon showing Muhammad in hell. (The partial version below, without depicting Muhammad, is reproduced from Corriere della Sera). It shows Virgil and Dante Alighieri outside a circle of flames looking down on Muhammad, whose body is cut in half. "Isn't that Mohammed?" Dante asks Virgil, who replies, "Yes, and he's cut in two because he has brought division to society." Virgil then adds: "The one with the pants lowered is the Italian political world bowing to Islam." The editor of Studi Cattolici, Cesare Cavalleri, said: "I hope the publication of this drawing won't lead to attacks, because if that happened it would only prove the idiotic positions of Islamic extremists. Sometimes a politically incorrect satirical cartoon can do some good. It's only a reference to a passage in the Divine Comedy. In any case, Muhammad was sent to hell by Dante." Apr. 16, 2006 update: Well, it did not take long: "Italian Editor Apologizes to Muslims," reads the Associated Press headline. Cavalleri said the vignette "was interpreted as being anti-Islam when, if anything, it was a denunciation of a cultural identity crisis in the West. In any case, if, contrary to my and the author's intentions, someone felt offended in his religious feelings, I willingly apologize as a Christian." News reports said Cavalleri is a member of the Catholic Opus Dei and Opus Dei on its Web site said it had no responsibility for the magazine and in any case, "we desire to apologize for any offense that was made." Apr. 24, 2006 update: In a audiotape released yesterday, Osama bin Laden called for the death penalty for the cartoonists: "Heretics and atheists, who denigrate religion and transgress against God and His Prophet, will not stop their enmity towards Islam except by being killed." He also lambasted the Danish government, which refused to apologize for the cartoons: "The insistence of the Danish government to refrain from apologizing and its refusal to punish the criminals and take action to prevent this crime from being repeated... shows that the notions of freedom of speech have no roots, especially when it comes to Muslims." The cover of Ansar al-Sunna. May 5, 2006 update: Ansar al-Sunna, a radical Islamic terrorist organization in Iraq with a significant presence in Europe, has published an implicit call to murder in an article in its online journal, Ansar al-Sunna. The article run through the events and lists dozens of European newspapers that reprinted the Muhammad cartoons. It argues that the incident is not the question of a single newspaper but "of international significance" and notes that "While it may prove difficult to make all Muslims carry out the divine verdict in this matter, the path of jihad against the enemies of God is still available." Der Spiegel sums up the gist of the article as "Something needs to be done, the prophet must be avenged." A German security establishment source expressed dismay: "We thought everything was over, but they're stoking the fire." Aug. 5, 2006 update: Six months after the cartoon crisis, Yemenis continue to boycott Danish products, reports Hakim Almasmari in the Yemen Observer. when walking in the majority of supermarkets in Yemen, rarely would you see Danish products back in the shelves, after they were taken off earlier this year. Posters and logos against Danish products are still visible on many street corners, buses, houses, office windows, cars, Mosques, schools, and local stores. … Sheikh Ameen Abu Ali, a university lecturer, and preacher says that he believes that most people are still sticking firm on the boycott as they witnessed that life can be the same without the products, and replacements for them are available. "People exchanged Danish products for local or Asian products. The issue does not need to be brought up again only if a softer stance on Danish products is seen among locals," Shiekh Ameen said. According to a local survey conducted by the staff of the Yemen Polling Center (YPC), 82% of those surveyed claim that they will continue the boycott until an apology is heard from the Danish government. On the other hand, 10% admit that they started purchasing Danish products again, while 4% say that they did not even consider the boycott and kept using the products. 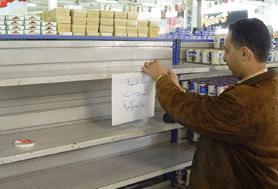 Hundreds of supermarkets in Yemen are boycotting Danish products, while a minority gave in. Young people have been very careful about buying Danish products, even those who are not known to be religious. "Some people say that only religious people are continuing the boycott. This is wrong, I don't consider myself anywhere close to religious but I vowed not to purchase Danish products again until the Danish Government apologizes," said Saber Ali Mohammed, a 25 year old who claims that he is not religious per se, but loves his religion and Prophet Mohammed (PBUH). Arla estimates it has lost as much as $75 million because of the boycott, which began in January. Sep. 3, 2006 update: The two suspects in a failed attempt to blow up two German trains were in part motivated by anger at the publication of the Danish cartoons. Jihad Hamad acknowledged that he and Youssef Mohamad el Hajdib considered the publications "an attack of the Western world on Islam," said Joerg Ziercke, head of Germany's Federal Crime Office. Sep. 4, 2006 update: Lorenzo Vidino provides a fuller account of this connection at "The Danish Mohammed Cartoons and the Failed German Train Bombings."